UV-proof HVAC duct and plenum sealant: micro-aluminum particles float to the surface and form a permanent real aluminum jacket over the duct sealant that prevents cracking due to UV rays from the sun -- RT-80 is the only duct sealant with this feature. Low odour, bright aluminum colour, elastomeric, fibre reinforced, high and low velocity. For outdoor use, non-sagging, non-cracking, remains pliable when frozen, meets SMACNA. standards, qualifies for LEED points. Can be applied outdoors in freezing weather. The contractor applied Robson‘s RT-38 and Robson‘s 10 Ounce Canvas as it is a lot faster and easier than aluminum jacket and more durable. Plus any insulator or apprentice can apply it. These products were developed by Robson Thermal Mfg. Ltd. specifically for the mechanical insulation trade. The RT-38 and 10 Ounce Canvas jacket forms a monolithic barrier that resists chemicals, acid rain, UV rays, driving rain, hail, fungus, and mechanical abuse. And it is more weather-proof than metal jacket. The following pictures are of a tank insulation job in northern BC, Canada. The tanks were insulated with tank wrap and jacketed with Robson‘s RT-38 and Robson‘s 10 Ounce Canvas. The tanks are located outdoors exposed to the weather. The owner wanted a protective jacket that would be more resistant to damage than metal jackets, and at a lower cost. The contractor saved 40% by installing the RT-38 and 10 Ounce Canvas instead of installing aluminum jacket. Plus, for out of town jobs, less labour time means less living out expenses too. Robson's Liner Coat is a water based, non-toxic, neoprene coating that repairs and restores and encapsulates the facing of acoustic duct insulation, and prevents fiber erosion. Pictures below show damaged acoustic insulation inside of an HVAC plenum before and after Robson's Liner Coat was applied. Such damage is common for insulation inside of HVAC plenums. Insulation fibers eroding into the HVAC air stream can create indoor health hazards and damage computers. Robson's Liner Coat is also used to coat the inside of HVAC ducts made out of rigid fiberglass board, also known as 'duct board' or 'fiber board' ducts. It encapsulates loose insulation fibers and dust, and prevents insulation fiber erosion for a small fraction of the cost of replacing acoustic insulation or replacing ducts. The floor of the supply air diffuser plenum was originally insulated with acoustic fiberglass insulation. The insulation facing was torn and damaged by hospital maintenance staff entering the plenum to do routine work. Two coats of Robson’s Liner Coat were applied to the plenum floor for 89% less than the cost of replacing the insulation. The floor of the supply air fan plenum was originally insulated with acoustic fiberglass insulation. The insulation facing was torn and damaged by school maintenance staff entering the plenum to do routine work. Two coats of Robson’s Liner Coat were applied to the plenum floor for 91% less than the cost of replacing the insulation. Belly Pans are part of the in-ground light fixtures used for airport runways. The black Belly Pans in background of picture were cleaned, processed, and treated with Robson Thermal’s unique molecular coating. Treated black covers have an increased life span of 3 -4 times the previous treatment. Grey cover in foreground has substantial corrosion, pitting, and chemical deposits after one winter. The Robson Thermal reconditioned unit is better than new. Usable life span of aluminum or steel Belly Pans is increased by 3 to 4 times by Robson Thermal’s unique 6 step processing and molecular coating. Prior to Robson Thermal’s services, such Belly Pans had to be replaced annually with new ones. 60% cost reduction: The airport's annual replacement costs for Belly Pans were reduced by an average of 60% after Robson Thermal's services. 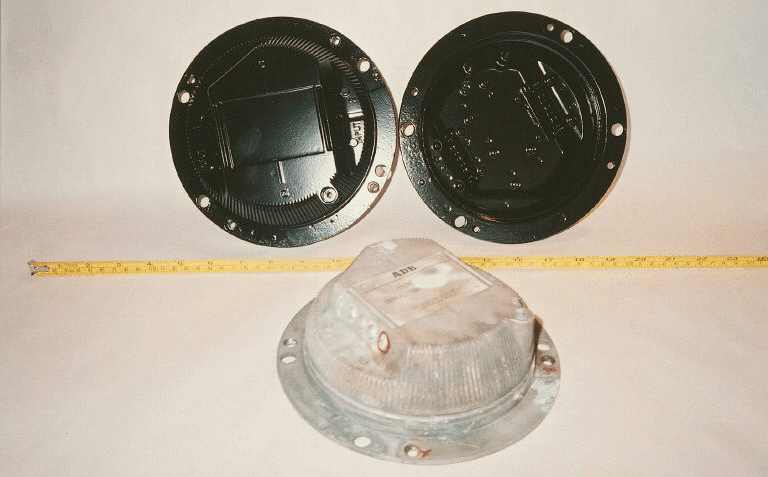 Glass Lenses for in-ground airfield light fixtures get significantly corroded, pitted, and coated by chemical runoff from runways after one winter. Opacity level of the lenses falls below acceptable standards after one winter. Robson's unique cleaning process restored the opacity of the lenses to required levels. The airport saved 80% by re-using the lenses instead of replacing them. Prior to Robson Thermal’s services, such lenses were discarded and replaced each year to meet government standards.